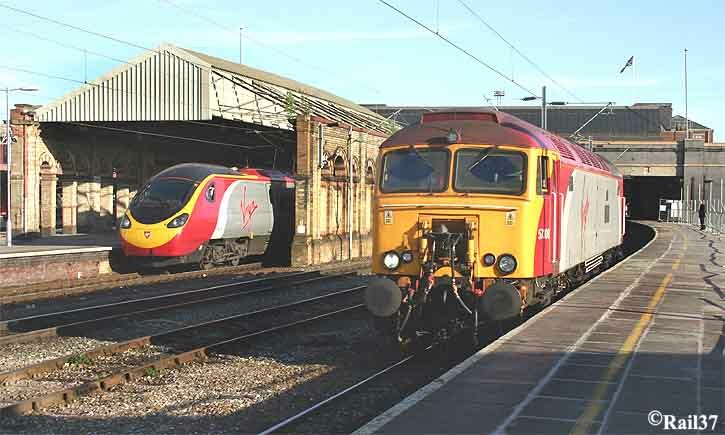 53708 "Tin Tin" was parked near platform 12 at Crewe, waiting for the arrival of the 17.21 London Euston-Holyhead Pendolino service, Y Ddraig Gymreig/The Welsh Dragon. 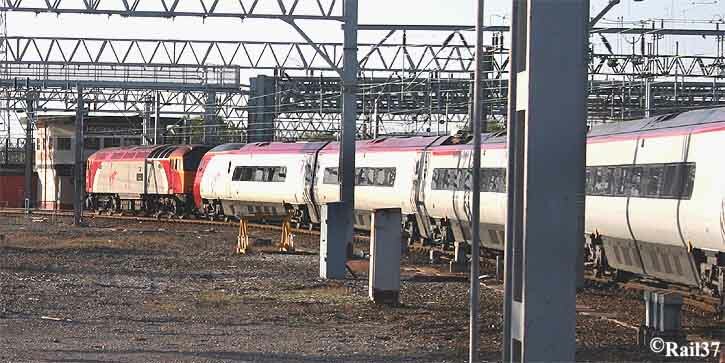 Pendolino units, being electrically powered, are dragged from Crewe to Holyhead by specially adapted class 57 diesel locomotives. 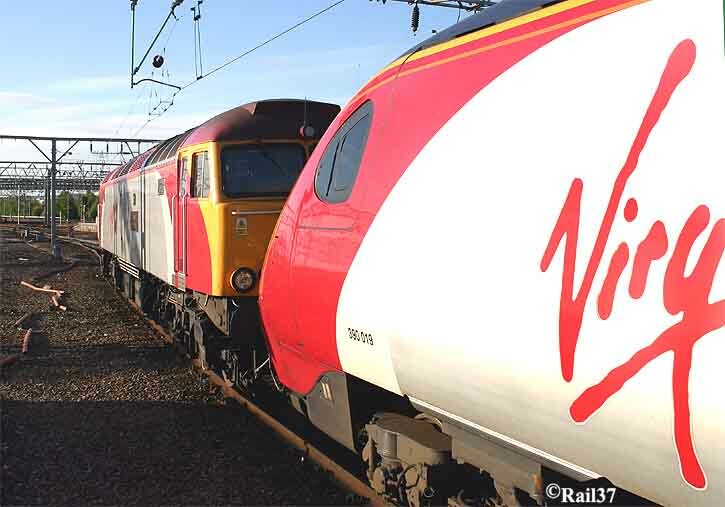 Class 57's are rebuilt from redundant class 47's, in this case 47846 "Thor". 308 received a green and ran out on to the Chester line in order to reverse into platform 12. 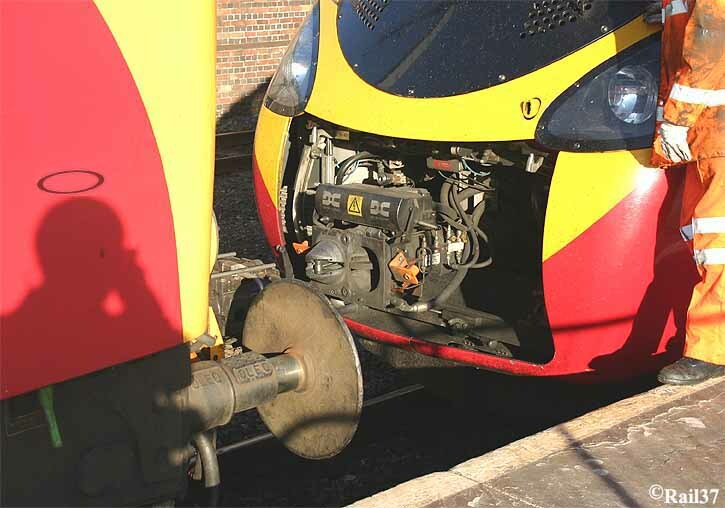 A new practice now applies in that the locomotive parks at the head of platform 12 before the arrival of the train, there being no locomotive to remove now. 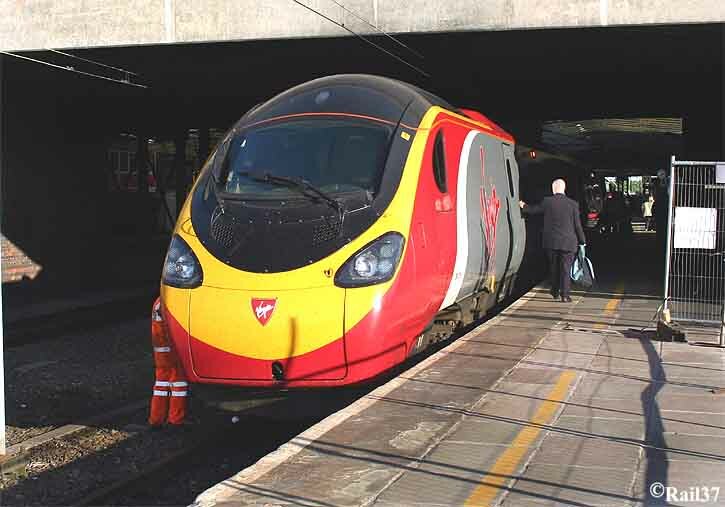 It's wall-to-wall Pendolinos at Crewe and North bound 390020 stopped in platform 11 as 308 waited for its own train to arrive. 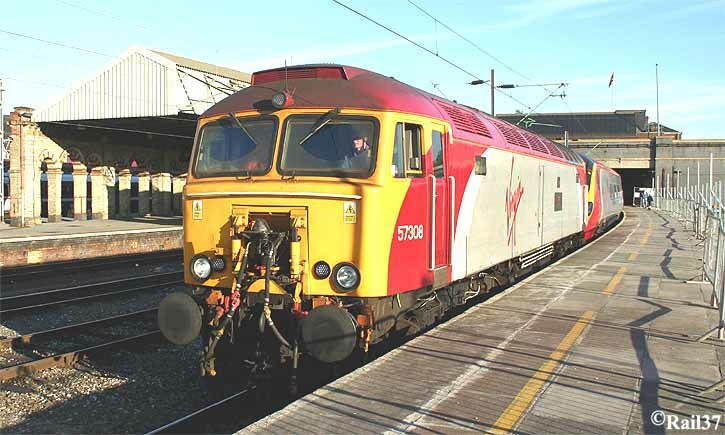 The shunter had arrived on the scene and lowered the Dellner coupling on the 57. 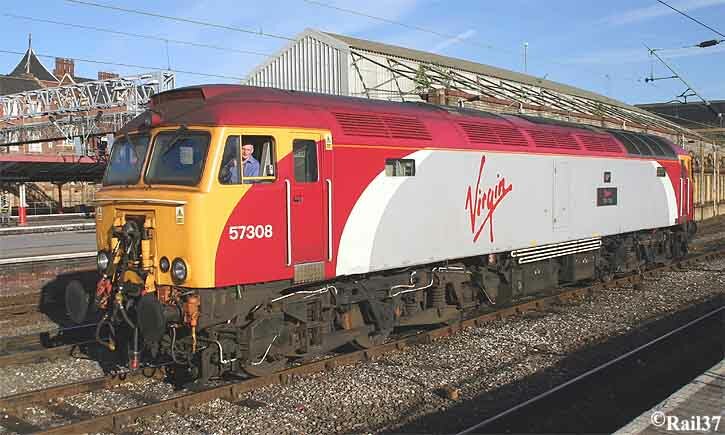 The appearance of the Holyhead train prompted him to head off down the track. Coupling theses units looked to be a very precarious job requiring a high degree of awareness. 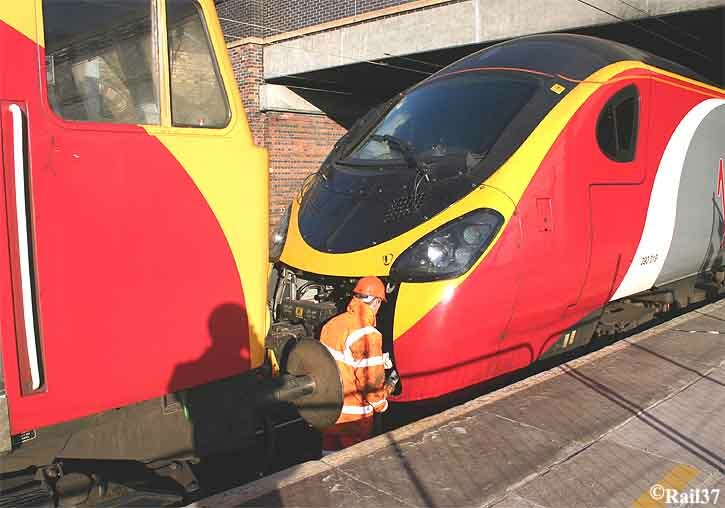 As soon as the Pendolino arrived the shunter started the connecting process by opening the coupling panel. 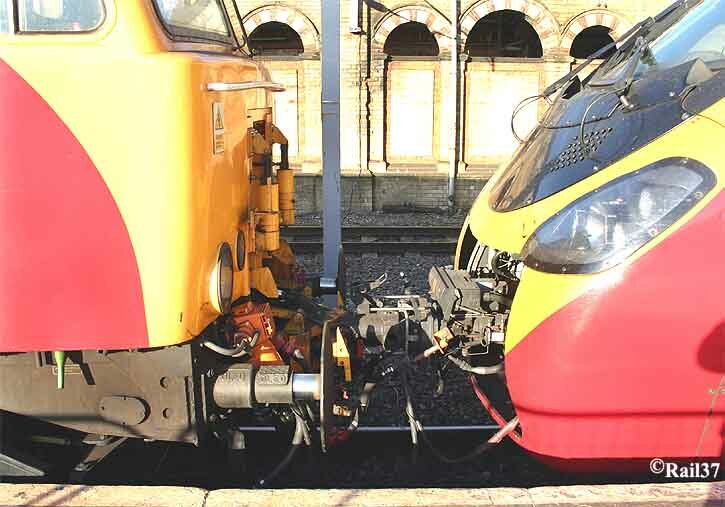 The coupling powered out like the inner jaws of Alien! It appeared to be a very complex piece of equipment with hoses and cables everywhere. 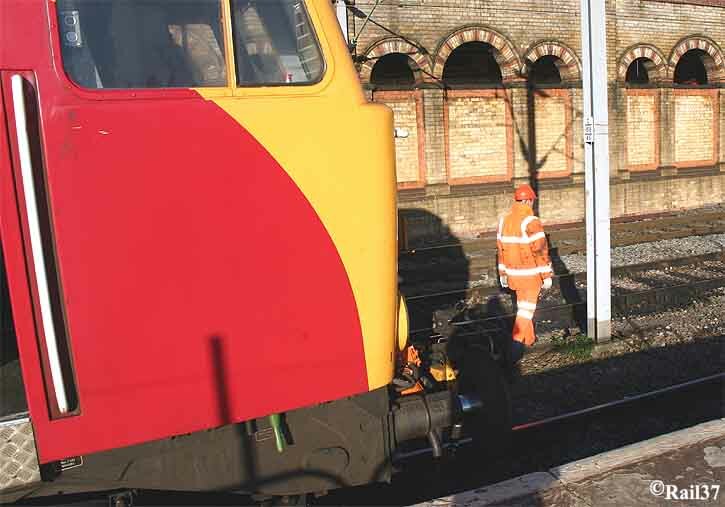 Everything was ready and the shunter called in the locomotive. Almost there as the evening Sun cast shadows across the platform making it difficult for the photographer to avoid inclusion. Contact, and now for the cabling up. 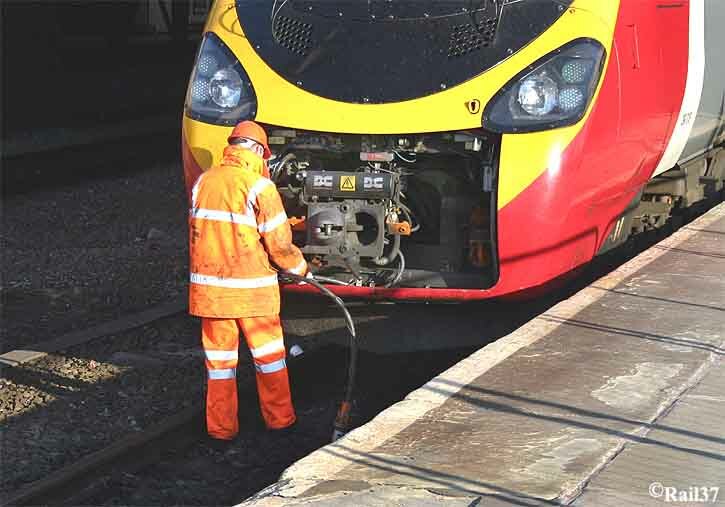 There is not much space in which to work and at one point the shunter had to get between the platform edge and the Pendolino body side in order to bleed air from the system. It would need hand brakes and wheel chocks to get me in there! He's a hero! The completed item and we had a "handshake". 19.23hrs and away on time, the whole operation was extremely swift and well co-ordinated which contradicts what we regularly seem to read. I have to say that the changeover process and the appearance of the stock were most impressive. 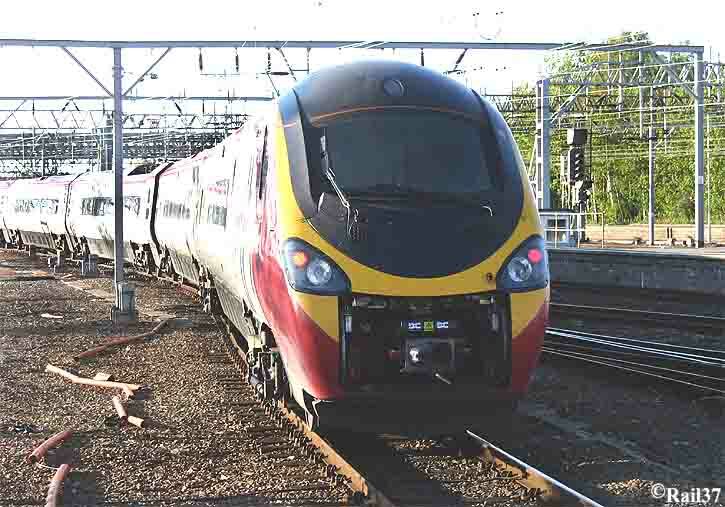 Whether it makes sense to drag an expensive electrically powered unit over non electrified lines on a regular basis is a matter of opinion. However, for photographic purposes, it is a very colourful affair. The driving cars would make wonderful observation cars for preserved railways! 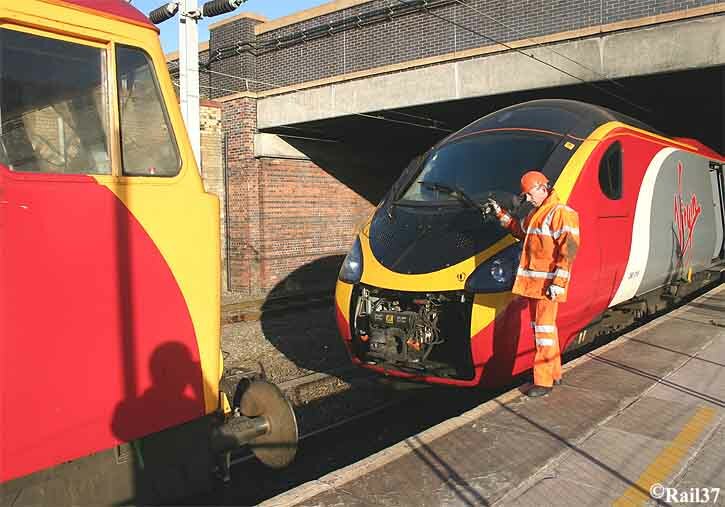 Is the end panel missing from the trailing car.